Last day in Buenos Aires, Argentina -January 27, 2015 - Blog from Buenos Aires, Argentina | South America!! We had a late night last night. We dressed up and went to one of the premier places in Buenos Aires for Tango, "Piazzolla Tango". It was one of those must-do things . . . how can you be in Buenos Aires without learning more about Tango and seeing some of the best perform this very intimate, passionate and complicated dance? 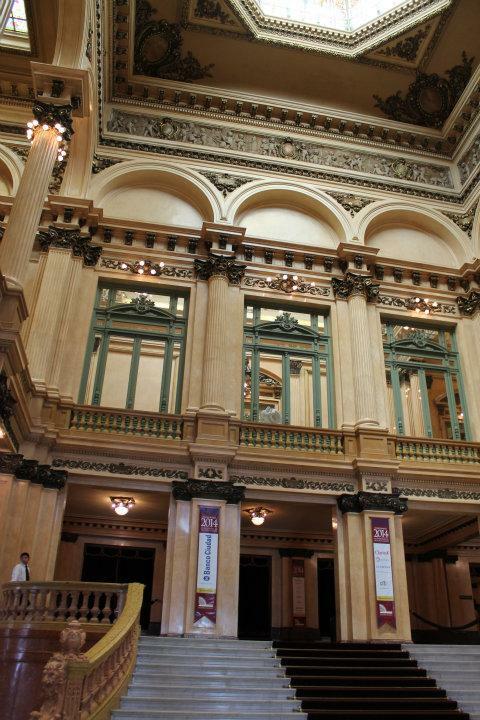 We met in the beautiful ornately decorated Galeria Guemes in the downtown area for Tango lessons. We learned from the lessons that Tango is indeed a complicated dance step, but our instructors made it look so easy and so very cool. After the awkward dance lessons, we had an exquisite steak dinner followed by the show which included an Argentine orchestra and expert dancers. It was very nice, indeed. But Stan and I still cannot Tango - we vowed to each other that we will practice. Ha! Since today was our last day in Buenos Aires, we did the last two things on our list . . . we visited the Botanical Gardens and we toured the Theatro Colon—our first visit ever to a premier opera house. The botanical gardens were beautiful, at least as beautiful as any botanical garden might be in "late July" heat. Although it was hot and dry, this garden was still much more lush that the gardens we visited in Rio de Janerio. The identity of almost all plants and trees were labeled. Too bad, though only the Latin and Spanish names were shown, but we could recognize the country of origin. We took a short break for a cerveza for Stan and iced tea for me - I'm learning how to correctly order tea with ice (te' y hielo). Iced tea is definitely not on the menu. I'm teaching the waiters round here a whole new game. Afterwards we went to the 3 pm guided tour to the Teatro Colon. The Sistine Chapel ranks number one, of course, but the Teatro Colon is perhaps the second most beautiful building I have ever seen. Please see the photos. Our tour took us throughout the building which was constructed between the period 1888 to 1908. The building copies great design from Italy and France and includes construction materials from Italy and Portugal, The gold you see in the gold salon is real. Gold on the columns and walls are from gold flake paint, the gold in the ornate designs on the ceilings is 24K. The people in our group got to in the most expensive and important box in all the theater. These seats are usually occupied by government officials or special guests - if the hoity-toity aren't in the house, the seats in this special box are sold and are the most expensive in all the opera house - about 2500 pesos per seat. This theatre has a capacity of 3,000 people (300 of which must stand) and ranks among the top three theatres in all the world for natural acoustics. No microphones are used at all. The opera season is not in session now; it begins a new season in March. Although I know so very little of opera, I cannot imagine the magnificent experience. Tomorrow we say good-bye to Argentina and hello to Peru. Four am wake-up alarm. Good night!